We optimized Voice4u to Android tablet, which now allows us to use in sideways (landscape screens). 2. “More” tab frees from the Menu Button. 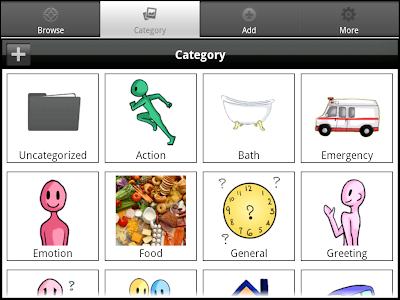 Just like the iPad version of Voice4u, you can use Voice4u on Android tablet sideways (landscape screen). As soon as the app is updated, it starts on landscape screen and you can enable screen rotations by turning on the switch in the application preferences (“More” tab > “Preferences” > Tap “Enable Screen Rotation”). This new feature is applicable to tablet devices. For phones and music player type devices, Voice4u can be used vertical ways (portrait screen). Now you can use Voice4u WITHOUT using the Menu button on the device. You can do everything with tapping the screen. Most of the current android devices come with the menu button, usually next to the home button and the back button. By pressing the menu button on a certain screen, it can show several optional menus on the screen. In the previous versions of Voice4u, we had to press the menu button to show screens for “About Us”, “Sending Feedback”, “Application Preferences (Settings)”, and “Trash Box” (to recover deleted icons). This Menu button had been a good option for tech-savvy users, but we all agreed that it was not user-friendly experience for all Voice4u users. So, we simply added a new “More” tab, just like the iOS version of Voice4u. You can now access to above four screens through the “More” tab. The next update (version 1.6) will fix another compatibility issues for Amazon Kindle Fire. The major issue found is that some of sounds are cut-off midway when playing them. Plus, we need to refine interfaces because the Kindle Fire doesn’t have either camera or internal microphone. But we confirmed that it’s possible to record voice with external microphone (e.g. earphone-mic for iPod touch) and grab photos from Google Image Search. Hope we can fix these issues as soon as possible!